In Singapore, we had Eurasian neighbours. Every now and then, the lady would send across something she had cooked -a devil curry, country captain chicken or yellow rice. In return, my mother would send across a pie, a freshly baked cake or even appam and curry and recipes would be exchanged. In course of time, the neighbours migrated to Australia and the local food exchange programme came to an end. Earlier this week, I was invited to review the Anglo Indian Snack Box food fest at Navaratna, the speciality Indian restaurant at Le Royal Meridien. My cookery class textbook from my school days, written by a Eurasian food expert, has a few Eurasian recipes in it (yes, I still have the book!). Looking at Navaratna's food festival menu, I was amazed at the familiar names and wondered if the flavours too were familiar. Is there a connect between Eurasian and Anglo Indian food? Chef Nandakumar, sous chef at Le Royal Meridien told me that the area around St. Thomas Mount is home to a number of Anglo Indians. Obviously, the most authentic recipes would be from the people who are experts at it. Eurasian curries use onions, garlic, cloves, cinnamon, fennel, nutmeg, mild curry powder, coconut milk, vinegar and tamarind. And lemongrass, shrimp paste and candlenuts. Anglo Indian cuisine uses almost the same ingredients, except for lemongrass, shrimp paste and candlenuts. Anglo Indian cuisine evolved when Indian cooks mixed elements of British cooking with Indian ingredients to serve their English masters. Hence soups were made from thin stock, tempered with pepper and cloves, meats were roasted with Indian spices, rice and meat curries were cooked in coconut milk to tone down spice levels. Two soups are on offer at the festival- Kenny Boy's Kanjee and Anglo Indian Pepper Water (mulligatawny soup). I chose the former. Such a catchy name and oh...what a soup. Chicken and barley in a flavourful light yellow broth garnished with coriander leaves, the soup was one of the best I've had in the longest time. It was served with soft bread rolls. Chilli Fish Nuggets had generous cubes of seer fish, a generous amount of red colour as well. The flavour of cumin was dominant but the fish was moist and fresh. I don't like lamb liver but for the sake of tasting, I did have a piece. Liver is one of those things that you need to cook right, otherwise it turns rubbery and tough. This one had the colour of Kerala style pepper fried liver only it wasn't that spicy. And it had been cooked just right- tender all the way with just the right amount of spice to make it a great starter. Mushroom stuffed with cheese, coated with a spicy chilly rub and fried. Don't miss this one. So delicious, the coating was crisp, the mushrooms juicy and the burst of heat was toned down by the cheese. The East India vegetable croquets were so-so. There was potato and boiled vegetable in the filling but the saving grace was the crunchy exterior. All the starters are beautifully plated with slices of cucumber, tomato, sliced onions and French fries. Railway mutton curry and yellow coconut rice - what a combination. If you're wondering how this name came to be, it's because in the days of the British Raj, similar curries were served in railway retiring rooms. 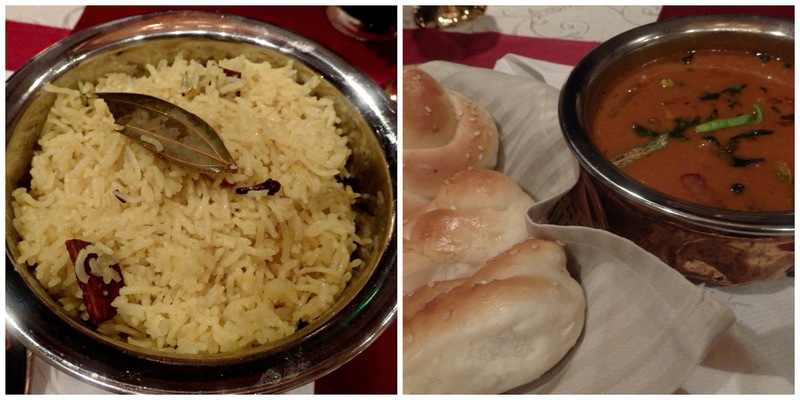 The curry was a thin gravy, always had vinegar as one of the ingredients to prevent spoilage, and was served with rolls. Navaratna's curry had a mild flavour, the meat was tender and the rice fragrant with spices. The curry is also served with buns. Dessert was bread and butter pudding, sprinkled with brown sugar and blow-torched. Thankfully, there was no sugar overdose and the bruleed top was the perfect play of textures with soft cubes of bread and the crunchy sugar coat. My waiter asked me if I could taste egg in the pudding- definitely no. Why is it called a Snack Box food festival. Chef Nandakumar says it's because the food is light, use of spices and curry powders restrained and one doesn't feel heavy after eating. I'm inclined to agree with him. The festival is on till August 31, only for dinner. A meal for 2, inclusive of taxes, costs around 2500/.